We are beginning to settle down a bit now that the gardens have been completely installed, the rain has been easing our watering duties, and the plants seem to be making themselves at home in their respective places. All of us in the Education and Community Programs Department have now taken a collective deep breath and are ready to move forward with preparations for the gallery installation beginning at the end of the month. In an effort to keep everyone abreast on what is happening within the three portions of Fritz Haeg’s residency — Foraging Circle, Edible Estate #15, and the exhibition featuring Domestic Integrities A05 — we have decided to do a weekly report on the ongoing efforts of At Home in the City. The At Home in the City rockstar intern team has also started a Tumblr of their own to keep a record of their activities related to the residency. Please visit The 5-H Club to see what they are up to! 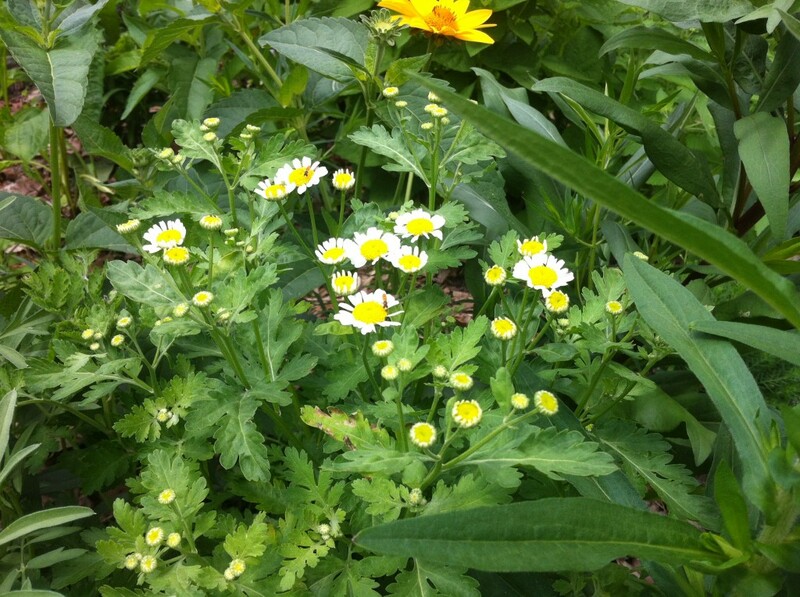 Foraging Circle: Last week the first of the perennials blooms emerged. Early Sunflower (Helianthus helianthoides) and a surprise Mexican Red Hat (Ratibida columnifera) as well as Feverfew (Tanacetum parthenium) and Borage (Borago officinalis) – technically self-seeding annuals – were the first to show their colors. While Early Sunflower and Mexican Red Hat are useful for attracting pollinators and the seed heads are great food for birds, Feverfew and Borage have uses within the home. Fewerfew is most well-known for its ability to help with migraine headaches. The flowers of the Borage plant can be candied and used in desserts. Borage leaves can also be eaten in salads when young or mature ones can be boiled and eaten as sauteed greens. If you want to read more about the plants in Foraging Circle, please check out Foraging Circle Field Guide. Feverfew and Early Sunflower in bloom. Photo by Anna Bierbrauer. Edible Estate #15: The Schoenherrs are keeping busy in their garden – both with the work it takes to upkeep such a large edible garden as well as with hosting friends and family in the space. Being the industrious folks that they are, they initiated Wednesday Pizza Nights where neighbors can join them for a few garden tasks and be rewarded fresh produce and fresh pizza at the end of the night. Last week they also hosted a friend for a talk on the medicinal power of herbs complete with a herbal tea infusion tasting. Find out more about how they are adjusting to owning an Edible Estate at their blog. 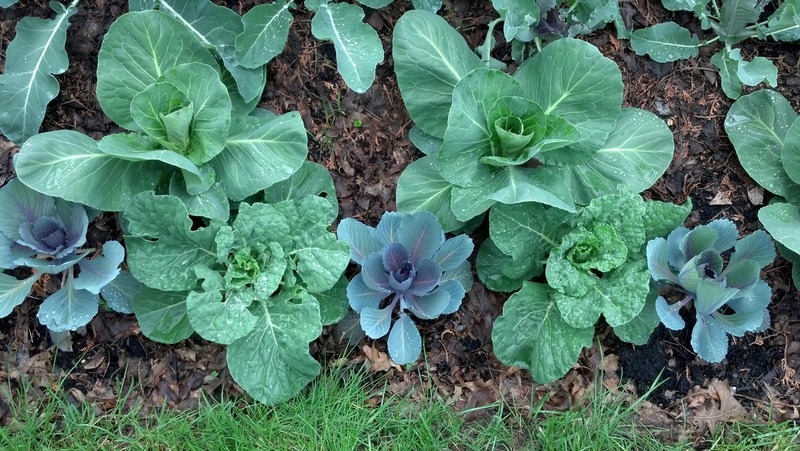 Brassicas are doing well. Photo by Andrea Schoenherr. Domestic Integrities A05: We have been busy sourcing furniture and materials for the gallery exhibition. Fritz had a brief layover in Minneapolis on Friday afternoon and spent most of it looking for furniture at Piccadilly Prairie. We are also in constant pursuit of old clothing and fabric so rug weaving can begin on July 30th. If you want to clean out your fabric bin or have some clothing to donate please let Ashley Duffalo (ashley.duffalo@walkerart.org) know. One of the largest pieces of the exhibit is going to be an aerial image of the Twin Cities metro on a wall measuring 13′ tall by 33′ wide. Not surprisingly, sourcing data with a high enough resolution hasn’t been easy but I dove into the world of ArcGIS and have had lots of help from the Minnesota Geospatial Information Office and the Community GIS Program at CURA. The extent of the aerial image for the gallery wall. Image from Google Maps. More to come next week!